Clock changes can disrupt our circadian rhythm, in terms of its timing e.g. when peaks and lows occur in the 24h cycle of hormones such as melatonin (the sleep hormone) that help regulate our sleep/wake cycle. With the clock change, it’s darker earlier in the evening. This in turn can increase our melatonin levels (stimulated by darkness) which can make us feel more tired initially in the days after the clocks change. However, light at home and the blue light emitted by electronic devices confuses the body by signalling that you are active through the suppression of melatonin. It’s therefore recommended that you dim light and avoid blue light 1-2 hours before bed time for a good night sleep. In winter, generally, the lack of morning light can disrupt your body clock by shifting it to a later time. Exposure to bright light (outdoors) in the morning ensures that your body clock keeps synchronised to the 24h day. 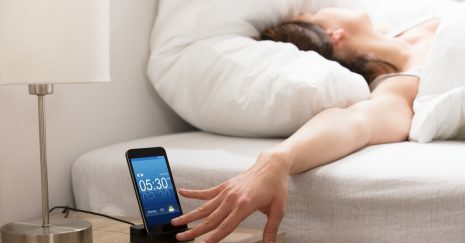 As we gain an hour as a result of this clock change there are also advantages, particularly for evening types who may be sleep deprived due to waking up early in the morning (social jet lag). On the contrary, extreme morning types may find it difficult to adjust to the time change, even though only a small change.